On the day that I sit down to write this review, a handful of violent gun incidents have made national news headlines. Sadly, I could have written that preceding sentence virtually any day, but having just finished reading LOCKDOWN by Laurie R. King, the day’s headlines seem particularly stark. I’m old enough to remember the Columbine massacre that catapulted school shootings into the public consciousness; tragically, there have been literally hundreds of school shootings since then. In her new stand-alone novel, master thriller writer King offers a portrait of a town and of a school community, vividly illustrating that the “I couldn’t believe such a thing could happen here” phenomenon could actually arise from anywhere. The school at the center of LOCKDOWN is Guadalupe Middle School, in San Felipe, California. It’s the kind of school where the principal’s husband is a volunteer, the school janitor takes a particular interest in kids’ well-being, and the very sight of a police officer is enough to put kids on their best behavior. That’s not to say that San Felipe is an idyllic place; it’s had more than its fair share of tragedy, especially lately. One girl, the older sister of an eighth-grader at Guadalupe, was shot and killed by a would-be suitor; and another sixth-grader, the enigmatic Bee Cuomo, disappeared shortly after the start of the school year. 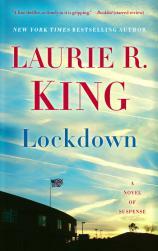 "LOCKDOWN is a welcome return of King’s contemporary thrillers, and a vivid reminder that acts of violence can occur even when and where we least expect them." But energetic and idealistic principal Linda McDonald is more than eager to put these incidents behind her and focus on the future. Literally, as she hosts Guadalupe’s Career Day, encouraging students to attend presentations by adults in a variety of professions and to dream about what their own chosen career might look like. Inviting so many strangers into the school offers security challenges, to be sure, but it’s also a chance to build community, and that’s what Linda strives for. Set over the course of a single day, LOCKDOWN traces what happens when the events of Career Day go horribly, tragically awry. Narrated from the point of view of more than a dozen different characters, it offers a multifaceted portrait of a school community on the verge of collapse --- even if almost no one recognizes that. Told largely in short chapters that quickly shift perspectives, the narrative also includes a handful of longer chapters that delve deeper into certain characters’ backstories. In an afterword, King mentions that some of these chapters were written as stand-alone short stories that only eventually became interconnected (side note: longtime King fans will welcome a cameo by beloved character Kate Martinelli in one of these longer chapters). As the tension mounts, though, the chapters become shorter and shorter, often no more than a sentence or two. Near the story’s climax, sentences carry over from one chapter to the next, illustrating through language and structure the interconnectedness of the Guadalupe community. At times, the buildup to the inevitable crisis may seem overly drawn out. The moment of truth, however, is both dramatic and surprising, causing readers to reevaluate everything they thought they had learned about the characters up to that point. LOCKDOWN is a welcome return of King’s contemporary thrillers, and a vivid reminder that acts of violence can occur even when and where we least expect them.